Exclusive £10 Gift Card with Orders Over £150 at Viking Spend over £150 with Viking and get a £10 gift card of your choice! Exclusive £20 Gift Card with Orders Over £300 at Viking Spend over £300 with Viking and get a £20 gift card of your choice! Up to 43% Off Selected Orders at Viking - 7 Super Deals With up to 43% off orders, the 7 Super Deals at Viking is the place to be. 25% Off Selected Writing Essentials at Viking With up to 25% off writing essentials, you will never be stuck without a pen! 3 for 2 on Selected Office Supplies at Viking Get more for your money at Viking and shop 3 for 2 on a great range of office supplies including tape, envelopes, note pads and more! 49% Off Selected Computer Cleaning Products with Orders Over £10 at Viking Keep your computer area clean with 49% off selected products at Viking! £60 Off Selected Office Chairs at Viking Invest in the perfect office chair that will allow you to work comfortably and save £60 when you shop at Viking. Exclusive £5 Gift Card with Orders Over £80 at Viking Spend over £80 with Viking and get a £5 gift card of your choice! Free Delivery on Orders Over £30 at Viking Save on delivery costs when you spend just £30 at Viking! Free Gift with Selected Ink & Toner Orders at Viking Order 3 toners or 4 ink cartridges to receive your free gift at Viking. Up to 69% Off Cleaning Products at Viking Feeling like it's time for an office spring clean? Head over to Viking where you can save up to 69% on cleaning products! Free Gift with Selected Hot Drink Orders at Viking Stock up on hot drinks for the office and bag yourself a free gift! Find a new deal every day at Viking-Direct.co.uk! Visit the online office supplies store and from the homepage you’ll see links to daily discounts, weekly deals and special offers to fill your shopping basket. Browse the department-specific offers and find discounts on multi-buys too; when you shop with vouchercloud, it’s worth stocking up on everything for your stationery cupboard! From office supplies and technology products, to furniture and printer ink, there are deals available across the whole store. There are thousands of products available to buy from the online store, so you’ll always be spoilt for choice. With low prices on high quality, here you can fill every stationery cupboard at home or in the office. When it comes to organising, Viking can always give you a helping hand and whilst Viking offers items from renowned stationery brands, you can also shop their own branded goods to stock up on reliable supplies quickly and inexpensively. From furniture to technology products you’ll find everything here and more. So whether you’re starting a new job, launching your own business, hiring new staff or prepping for a new semester - make Viking your go-to. How do I use my Viking voucher code? Click ‘Checkout’ to complete the order process. Sign up to receive Viking updates and you'll even get sent news, exclusive offers and discounts straight to your inbox. There is an amazing clearance section on the Viking website which you can browse all year round whilst you wait for any other sales that may pop up! Delivery is free on orders over £30, with a fast and reliable service you can now avoid the hassle of in-store shopping. Should you wish to browse the products on offer at Viking using a catalogue, you can request both the General and Monthly versions by filling in the online form here - please allow up to 5 working days for delivery. Standard Delivery is free over £36 - arrives same working day if you order before 10am. Standard Deliveries made on Saturday or Sunday arrive on Tuesday. You can organise a return with Viking by calling 0844 412 1111. With more than 20 years in the stationary mix, Viking Direct is that company with a difference. 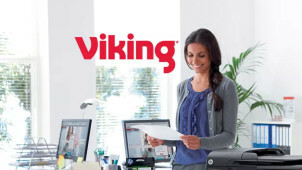 Established in 1960 and now present in over 16 countries worldwide selling 1000s of office supplies to happy customers each year - use a Viking voucher code today and join the club of savvy shoppers who always save a bob or two with Viking. For high-quality essential goods, you can trust in Viking. With many orders you can qualify for free gifts, so now you can get more for your business from Viking with their special deals. Simply order your supplies to enjoy treats and useful freebies to share around the office. Because from Quality Street chocolates to a 4-drawer cabinet for all your files - you never know what you could get! Being comfortable at work is a must, so we always check out the offerings at Viking in the Furniture and Seating department. Use a Viking discount code and you'll even save on goods for every person, and for every type of space there will be a desk to suit. Go ergonomic, and focus on your posture - nothing will get you through the day better than with a great chair to support you through every hour!